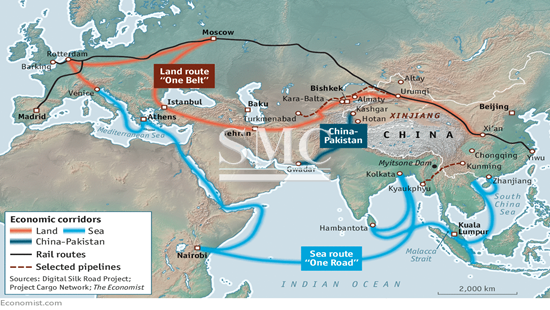 China’s One Belt One Road Initiative (OBOR) that began in 2013 aims to link more than sixty-eight countries, boosting communication, transportation, and trade around the world. By increasing and improving network infrastructure, logistics, industrial and energy projects from China to Europe governments and big businesses have potential for large economic and social growth. However, often times we look past the “little guys” and the everyday people that are being effected by these massive improvements to their native regions. The OBOR initiative is building infrastructure and trade networks across Asia, Africa, and Europe. These networks are increasing trade and creating jobs that are not only benefiting big businesses and governments but also the everyday people living in these small towns and villages. Where once remote unconnected villages were now have roads and trains to connect them to larger towns. Rural fishing villages are being transformed into large ports. Open fields are becoming factories. These changes are creating jobs and opportunities previously unheard of in their respective regions. Stories of people and villages being lifted out of poverty are emerging. Such as Chamraeun Sreytouch, a young girl previously at the top of her class in her Vietnamese middle school until she came down with a devastating disease that deprived her family of their economic well being. She could not attend school for five years, but after her father suggested taking Mandarin lessons in the countryside she has now been given a new purpose in life. Many Chinese people have come to her region to open factories, giving her the opportunity to do some translation work and earn an income. She now studies at the Royal University of Phnom Penh. Vietnam and other other Asian countries are not the only places seeing immense benefits. Places like the war torn town of Aleppo, Syria are also seeing benefits from the OBOR initiative. Ameer Anis, 32, a soap maker narrowly escaped death when a shell blew up along the road he was driving on. These soaps are a traditional Syrian craft and are now being exported via OBOR infrastructure to Tianjin, China in large quantities. This trade is what has kept Ameer and his family from fleeing their home. These are just a few examples of people’s lives being changed for the better thanks to the OBOR initiative. There are thousands of other stories like these, and the OBOR initiative is just breaking ground. The OBOR initiative has potential to help hundreds of thousands more like Chamraeun and Ameer.